Though formal talks aimed at uniting the factions within the Sri Lanka Freedom Party (SLFP) failed to produce results last week as the two sides declined to soften their stances, it is revealed that fresh attempts have been made through different political conduits to achieve the objective. Some members, hell-bent on uniting the factions, haven’t abandoned other avenues in their attempts to succeed. From the eyes of most observers, formal talks appeared to have failed after the SLFP faction led by President Maithripala Sirisena declined to relinquish their positions in the Government as a condition to join hands with the Joint Opposition, in the run-up to the elections. The other side wasn’t ready to soften its stand come what may. The Joint Opposition believed the momentum created against the Government would be lost in the event of a compromise being made. However, fresh efforts are now underway to bring about unity between the two factions. For this purpose, it is learned that various intermediaries have been sent to former Economic Development Minister Basil Rajapaksa who spearheads Sri Lanka Podujana Peramuna (SLPP) seeking a compromise with President Sirisena. The individuals handling the intermediaries believe that their efforts would pave the way for the two groups to contest the polls under one banner. Some leading Buddhist monks have also been identified as intermediaries to establish unity in this regard. Science, Technology Research Minister Susil Premajayantha is acting as one intermediary and is trying to figure out ways and means to merge the two groups before the elections. In this regard two proposals have been made by those supporting the president. One proposal forwarded is to contest under the People’s Alliance (PA) banner, a political formation that brought the SLFP-led coalition to power in 1994 and ending the 17-year rule of the Untied National Party (UNP). Since 2001, the PA has remained politically inactive as the SLFP formed the separate alliance called ‘the United People’s Freedom Alliance (UPFA). At present the present PA Chairman is former President Mahinda Rajapaksa whereas the General Secretary is former Prime Minister D.M. Jayaratne. What is proposed is to field candidates from both sides under the PA’s chair symbol. The second proposal forwarded is to divide the local bodies, so that both factions can contest separately. If that is worked out, the Joint Opposition wouldn’t contest in some local areas enabling the President’s party to be in the fray. In other areas, the President’s side will refrain from contesting, making way for the Joint Opposition to canvass for votes. The President’s side has agreed to offer most local bodies to the Joint opposition, during the elections. Against fresh overtures being made, the leaders of the Joint Opposition met with former President Mahinda Rajapaksa on Monday evening at his Colombo residence. They discussed the two proposals at length. The leaders expressed differing views and finally it was decided to refer the matter to the group meeting of the Joint Opposition that was to be conducted at the parliamentary complex, last evening. Some leading Buddhist monks have also been identified as intermediaries to establish unity in this regard. Eminent Buddhist monk Ven. Elle Gunawansa Thera, who is in contact with both the former President and the current President, has been approached in this regard. Gunawansa Thera told this columnist that he had agreed to play a role, but laid down conditions for both sides. “I was asked to play a role. I placed three conditions for all who are concerned. One is that the constitution making process shouldn’t be proceeded with. The second is that legal action should be instituted against those responsible for the Central Bank bond scam. Finally, there has to be an agreement to stop the alienation of national assets. I proposed to appoint a national council which will even comprise members of the patriotic forces so that decisions can be taken regarding national assets,” the monk said. He said that the country was faced with a grave crisis and the political forces, concerned about the nation’s future, should have a holistic view at this juncture in the greater interest of the people. “There is something more than winning a local body here,” he said. It still remains uncertain whether unity can be brought about. Be that as it may, both the Joint Opposition and the President’s SLFP continue to make individual preparations to contest the elections. That is to make sure that they have fallback options in the event talks fail. In the overall context, President Sirisena is ready to reach some understanding with the Joint Opposition. However, the dominant opinion of the Joint Opposition is that it should not join the SLFP. The soaring cost of living turned out to be a topic that fulled a heated debate at Tuesday’s cabinet meeting. The high prices of coconuts and rice, caused by a shortage in supply, have made the cost of living rise high. In fact, the Cabinet was informed that inflation was jacked up 33 percent by the high price of coconuts and 27 percent by rice prices. Minister Premajayantha, quoting findings from the observation tour he made to the Nugegoda Public Market, presented a price list and revealed how the cost of living has shot up despite efforts made by the Government to contain it through various means. Megapolis and Western Development Minister Patali Champika Ranawaka made an analysis of his expenditure on grocery items and showed how the increasing coconut prices had contributed to the surge in inflation. Finance Minister Mangala Samaraweera found fault with Lanka SATHOSA, the state owned retail chain, for not maintaining sufficient stocks to be released when and where necessary to contain price hikes. At present the present PA Chairman is former President Mahinda Rajapaksa whereas the General Secretary is former Prime Minister D.M. Jayaratne. Industry and Commerce Minister Rishad Bathiudeen, who is in charge of SATHOSA, rebuffed this criticism saying he wasn’t receiving enough assistance from the Finance Ministry to act in this regard. 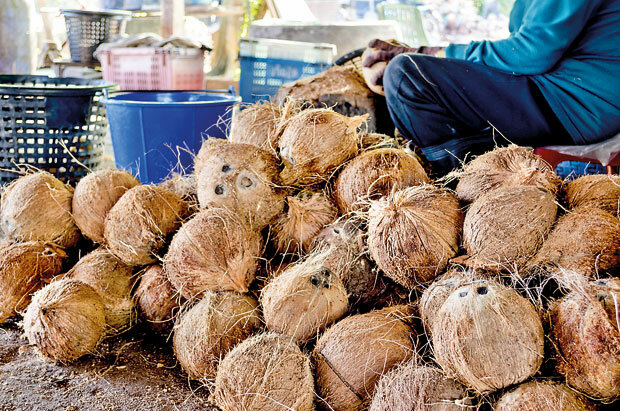 As for coconuts, Sri Lanka produces three billion nuts per annum. The bulk of this produce is released to the market for household consumption where it is used as a major cooking ingredient. The crop failed this time due to the drought that prevailed. Alongside this, there is a surge in demand for nuts by the companies involved in turning out value added products. It has also caused a reduction in the number of nuts available in the market for household consumption. These are the twin factors that have caused an unprecedented hike in prices. Finally, the Cabinet decided to grant approval for the import of coconut kernel to be used for value added products. President Sirisena sounded a warning at the same Cabinet meeting regarding Government officials travelling abroad for days on end. Some Ministers brought to his notice that the activities in their Ministries had been crippled due to the long overseas visits made by these officials. The President said such visits had to be limited.